Volkswagen is airing two television commercials during the Super Bowl XLV on February 6, one featuring the 2012 Passat, the other heralding the arrival of the 21st Century Beetle. 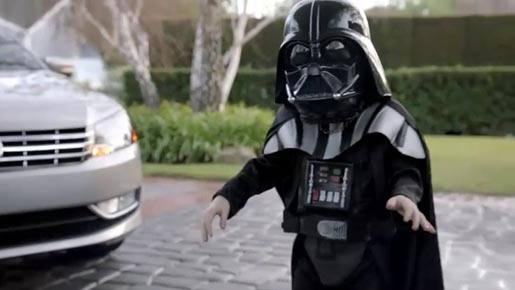 “The Force” features a young boy dressed as Darth Vader who walks around the house practicing his skills with telekinesis (using psychic ability to move or influence objects). Finally he seems to succeed on the new 2012 Passat in the driveway. “Black Beetle”, using a new version of Black Betty, features a photo-real lush kingdom where the Black Beetle rules, runs, navigates and out performs all the other creatures. The Volkswagen Super Bowl campaign was developed at Deutsch, Los Angeles, by group creative director/copywriter Eric Springer, group creative director/art director Michael Kadin, associate creative director/copywriter Jim DiPiazza, associate creative director/art director Mark Peters, copywriter Matt Sherman, art director Paul Oberlin, director of integrated production Vic Palumbo, senior producer/music supervisor Marisa Wasser, working with Volkswagen VP of Marketing Tim Ellis, general manager of brand marketing Brian Thomas. Filming for “The Force” was shot by director/DP Lance Acord via Park Pictures, Bicoastal/London, with executive producer Jackie Kelman Bisbee and Mary Ann Marino, line producer Patricia Frazier, head of production Dinah Rodriguez, production designer Jeff Mann and costume designer Melinda Eshelman. Filming for Beetle was shot by director Dante Ariola via MJZ with director of photography Fred Elmes, executive producer Jeff Scruton. Editor was Jim Haygood via Union Editorial, with executive producer Michael Raimondi. Post production was done at The Mill, London, by telecine artist Adam Scott, lead 3D artists Tim Bussell and Juan Brockhaus, lead 2D artist Barnsley, producer Gemma Smith, explosion artist Jon Spencer, producer Russell Simins. Sound was designed by Eddie Kim and Amber Tisue at 740 Sound Design with executive producer Scott Ganary. Audio post was produced at Eleven Sound by sound engineer Jeff Payne. “Black Betty” was rerecorded by Jon Spencer and the Blues Explosion. Music in “The Force” is The Imperial March, from Star Wars, by John Williams. See the 2010 Punch Dub Super Bowl campaign starring superstar musician Stevie Wonder and comedian Tracy Morgan.